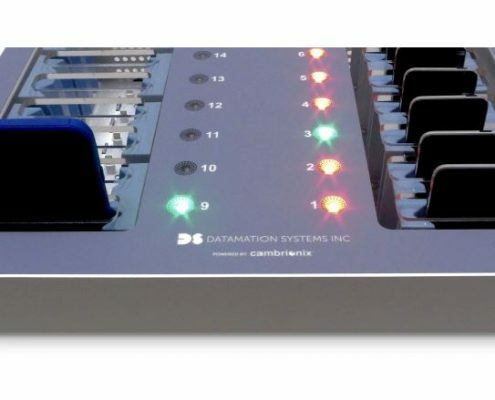 Press Release - Cambrionix & Datamation Systems join forces on UniDock ™ - Datamation Systems, Inc.
Cambrionix today announced that their long term relationship with Datamation Systems Inc in the USA has resulted in another groundbreaking product aimed specifically at the healthcare sector. The UniDock product is designed to dock, charge, and transfer data to/from mobile devices deployed within mission critical environments such as healthcare. UniDock incorporates a number of novel, patented, mechanical designs which allows the UniDock to accept multiple cellphone sizes from basic smartphones to large ‘plus size’ phones and ‘phablets’. No longer are companies tied to specific cellphone designs to fit their proprietary dock made specifically for a particular cellphone. The UniDock supports Apple Lightning, Micro-USB or USB-Type-C cable connections to any OS. To accept a particular cellphone or case size, the UniDock can be adjusted by Datamation or the end user. Cambrionix are the proud suppliers of the internal electronics to complement the robust mechanical design of the UniDock. “Cambrionix has been designing electronic hardware components for our mobile device charging and connectivity for many years. They are the obvious choice for mission-critical products like UniDock where downtime can cost lives. Adding their ‘powered by Cambrionix’ labelling to our product ensures that our customers know we use safe, reliable, professional electronics.” said Jerry Raymond, President, Datamation Systems Inc.
A number of companies in the United States healthcare sector are deploying mobile devices as their primary means of communication between staff at all levels. Using mobile devices, such as the Apple iPhone, means that staff can access hospital and patient care data and make, and receive, voice/video calls, accept messages, and access reference material right at the bedside. There are a number of clinical communication companies who have developed mobile applications which address the security concerns and can allow secure, reliable communication of patient data. With tools like UniDock, these companies can also improve tethered provisioning and offer remote diagnostics and ‘lock-down’ of lost or misplaced devices. UniDock includes full compatibility with the Cambrionix Application Programming Interface which allows software engineers to leverage the powerful hardware features and write user-defined scripts to control and monitor each connected mobile device. UniDock does not require WiFi infrastructure to be used for device management and, as a result, is robust and secure especially for large data transfers, OS updates and data security patches. Cambrionix Ltd is based in St Johns Innovation Centre, Cambridge, UK. They specialise in the design and manufacture of large scale mobile device management hardware and software solutions and have a client list which covers the worlds largest mobile device ODMs. Cambrionix operate within the IT sector and all design and manufacture is performed in the United Kingdom. Datamation Systems is based in New Jersey, USA. They design high-security IT management systems for many sectors including healthcare, retail, hospitality and education as well as IT deployment and support organisations. Datamation Systems operates within the IT sector and all design and manufacture is performed in the United States.